The personal doctor for Felipe Massa has said that the Brazilian is able to see from his left eye after some concern that he may have lost vision in it. Massa is reported to be making good progress after a serious incident at the end of Q2 on Saturday that saw a spring from the rear of Rubens Barrichello's Brawn car strike him on the crash helmet at high speed. The incident was alarmingly similar to the accident that killed 18 year old Henry Surtees the weekend before at Brands Hatch. Initial signs during the qualifying session were that Massa had simply crashed into the tyre wall and looked to be a non-serious accident. However Massa was transported by helicopter to hospital and underwent an emergency operation on a fractured skull. News on Saturday night reported that the Brazilians injuries were 'life threatening'. Fortunately Massa has made good progress since and today communicated actively in three languages with various visitors. It is virtually certain that he will be out of Grand Prix racing for the remainder of the 2009 season, however it is too early to say if he will be able to compete in the 2010 championship. Obviously the first priority for him is to return to good health and Grand Prix Blogger wish him a speedy recovery. 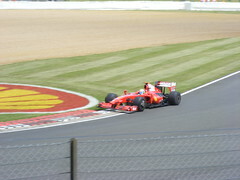 Massa during practice at the 2009 British Grand Prix. Any developments on Massa's injury will be reported here on Grand Prix Blogger.